Ctrl alt dlt: a chronicle of the nervous breakdown of liberal media politics but what next? Tom Baldwin has been on a rollercoaster ride of media and democracy in the UK (and USA) for the last few febrile, fetid and fantastic decades. As someone who has worked for left and right wing newspapers and for politicians and Great Causes, he knows how the punches have landed. He’s disappointed. In the system and his own role in it. Baldwin was a political journalist for the Telegraph and the Times as well as a spinner for Ed Miliband. As he will acknowledge he was a classic transactional political journalist trading leaks for headlines. He was at the centre of a vicious cycle of spin that diminished democracy, even while those involved strove to further progressive policies. 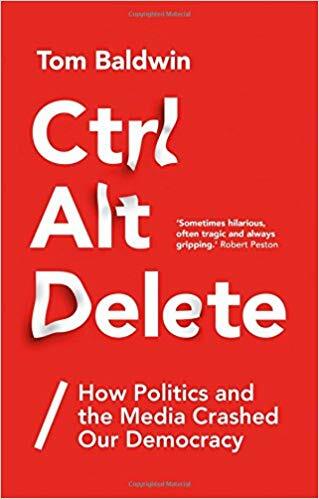 And now that the world has gone mad, with this book, “Ctrl Alt Delete”, he gives a road map to the ruins. At one level this is a text book that gives us the recent history of that eternal battle between press and politicians, media and masters. It’s a bit like those Facebook reminders of what you were doing five or ten years ago. Really? We thought social media would enhance democracy? You’re kidding? Digital technology can unravel Middle Eastern dictatorships? Gosh, we thought that? This is a valuable compendium of US/UK political communications episodes through the Internet era. It’s all here. From the early days of Howard Dean, Joe Trippi, and New Labour on to The Big Society, The Daily Me, and then latterly Brexit, Trump, Corbyn and Facebook. It charts the evolution of the vicious cycle of spin in the digital era, the arc of disappointment from optimism to reaction and finally asks if democracy can be rebooted. Reading this was like drowning in my own recent history. It all flashed past. Baldwin lists all the battles in digital democracy between journalism and politicians. He understands from the inside how the old settlement of the Fourth Estate has been disrupted. He charts how the digital optimists (er..me) who heralded a new dispensation were disillusioned. He astutely spots that this happened much earlier than we realised. Obama, for example, was only interested in fund-raising via digital, not governing. This dredges up some shopping trollies from the canal of media and democracy. He tours around the key figures, episodes and experts. But other ghosts appear. Why did Steve Hilton and Derek Draper matter so much? How did Jim Messina become the Messiah? The book fast forwards to the present. What do we do about Facebook and the other digital giants stomping across the democratic landscape? Clearly, this is something I’m obsessed with personally. As a journalist and latterly a think-tank director, I was part of the same media carnival that Baldwin describes and my personal politics is not far from his. I am also trying hard to understand it from a more distanced perspective as I write the first draft of the LSE’s Truth, Trust and Technology Commission report due for publication this autumn. Baldwin has done us a service by recounting this narrative. He defends the trades of hack and spinner to a degree. I agree that it should be a battle, a contestation. But he is now appalled at how they have diminished democracy, albeit sometimes with the best intentions. His descriptions of controversies such as the ‘dodgy’ Iraq dossier are fair-minded and not self-serving (at least not much). They are a useful reminder to those on all sides of the political divides that recent media/political history is more complex than many partisan campaigners allow. I would love those toiling away at the Canary or Breitbart to read this. He is relatively gentle on the digital giants, but he makes it clear that they must do better with their social and political responsibility than the news media and politicians have done in the past. My more academic colleagues would say that this book lacks a ‘theory of change’. It rushes on too fast to draw deeper conclusions from the mess it describes. Perhaps that is the nature of the problem? The fact that Baldwin is now embarked on a campaign for a second EU referendum suggests he is irresistibly drawn to the particular struggle rather than looking for a structural shift. I can sympathise with that. The fact is that while media matters, politics matters more. And while we are all ideologues, it is the here and now where power resides. And that is where journalists and politicians live. Even more so now in an on-demand, 24/7 media world. I am increasingly convinced that we are in an era of low-trust, multiple-truth democracy. That may not be a bad thing. It’s better than the high trust, simple truths of populist or authoritarian politics preached and practiced in places like China, Italy, Hungary, Trumpland or Brexitville. The challenge for journalists – especially liberal ones like Baldwin (and me) is how we sustain the ethics of social democracy in the brutal times to come. This book is a very useful runway to that journey. [This article by Professor Charlie Beckett, director of Polis, the LSE’s journalism think-tank and leader of the LSE Truth, Trust and Technology Commission. @CharlieBeckett].